EIA projects that trends in coal production in the United States could range from flat to continuing declines through 2040. Electric power generation accounts for more than 92% of U.S. coal demand, and domestic coal production has declined significantly over the past decade as coal has been displaced by natural gas and renewables in electric generation. EIA’s Annual Energy Outlook 2017 (AEO2017) includes cases with alternative assumptions about U.S. environmental policy and levels of oil and natural gas resource development and technological advancement. Across these cases, the outlook for coal can vary considerably based on its relative economics compared with natural gas and renewables in the power sector. The AEO2017 also presented a version of the Reference case without the effects of the Clean Power Plan (No CPP case). After the release of AEO2017, EIA developed an additional case without the Clean Power Plan under High Oil and Gas Resource and Technology assumptions. The AEO2017 Reference case, which is designed to apply all current laws and regulations (including the CPP), forecasts U.S. coal production declining from 740 million short tons (MMst) in 2016 to 620 MMst in 2040. By 2040, U.S. coal production drops to roughly half the level of peak coal production reached by the United States in 2008. Coal generation and production are significantly higher in the No CPP case, which otherwise applies the Reference case resource and technology assumptions, as the existing fleet of coal-fired generators can be more fully utilized and fewer coal-fired generators are retired. As a result, in the No CPP case, coal production stabilizes at about 900 MMst from 2025 through 2040. The adoption of High Oil and Gas Resource and Technology assumptions, which reflect a more optimistic outlook for natural gas supply—assuming lower natural gas prices compared with baseline resource and technology assumptions—lowers projected coal use. In the High Oil and Gas Resource and Technology case with the CPP, EIA forecasts that coal production declines to 500 MMst in 2040 as natural gas-fired generation outcompetes coal-fired generation in all years. As shown by the smaller difference between the solid and dotted lines in the right-hand panel of the generation graphic than in the left-hand panel, the CPP is projected to have a smaller effect on coal-fired generation under high resource and technology assumptions than under Reference case resource and technology assumptions. Under the high resource assumptions, natural gas prices are considerably lower, making natural gas more likely to displace coal regardless of whether or not the CPP takes effect. These projections are also helpful in assessing the separate impacts of lower natural gas prices and the implementation of the CPP on coal-fired generation. Projected coal-fired generation under Reference Case resource assumptions with the CPP (solid line in left-hand panel) is quite close to its level under High Resource and Technology assumptions without the CPP (dotted line in right-hand panel), indicating that lower natural gas prices could result in a similar reduction in coal use as the reduction due to the emission constraints of the CPP. In the High Oil and Gas Resource and Technology case without the CPP, natural gas and renewable generation remain similar to the case with the Clean Power Plan. However, because electricity prices are lower, total electricity generation is higher in the High Oil and Gas Resource and Technology case without the CPP, and most of this increase is provided by coal-fired generation. Nuclear generation is also somewhat lower in this case through 2040, as the absence of the Clean Power Plan moves more coal into the lower-cost segment of the dispatch order. Market-clearing dispatch prices, which are already held down by low natural gas prices, fall even lower, leading to some additional retirements of nuclear power plants. To the extent that operators decide not to retire additional nuclear capacity, the higher amount of coal generation that occurs in the absence of the CPP would be partially offset by reductions in natural gas and renewable generation, as occurs in the absence of the CPP under Reference case resource assumptions. In the Reference case, about 96 gigawatts (GW) of the existing fleet of 265 GW of coal-fired electric generating capacity in 2016 is projected to retire or convert to natural gas by 2040, very close to the 93 GW of coal-fired capacity projected to retire or convert under high resources and technology assumptions without the CPP. 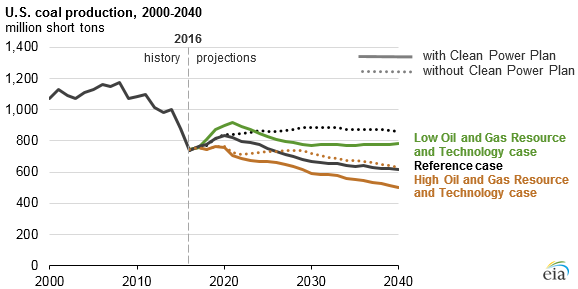 Projected retirements or conversions of coal-fired capacity are higher, about 124 GW, in the High Oil and Gas Resource and Technology case that includes the CPP, and lowest in the No CPP case, where most occur prior to 2025. In the Low Oil and Gas Resource case, shown in the middle panel of the generation graphic, oil and natural gas development is projected to be slower as higher development costs result in higher natural gas prices to the power sector. Natural gas generation is displaced by a combination of increased zero-emission generation from renewables and nuclear as well as coal-fired electricity generation, which remains near or slightly higher than its 2016 level. In this case, coal production remains near 800 MMst from 2025 through 2040. Few coal-fired power plants have been added in recent years, and in all of the AEO2017 cases, no new coal-fired generating capacity is added. In all cases, annual coal production remains below the 1,000 MMst level last seen in 2014. Detailed production data by year, region, and coal type are available through the Annual Energy Outlook 2017 Interactive Table Viewer.